"I'm inviting you to dig up your patterned papers and get inky by stamping right on them to create something totally new and different. 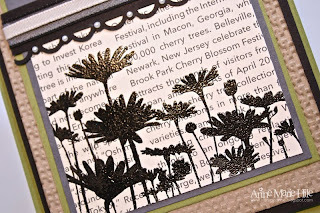 Imagine the dramatic background a simple damask stamp on a striped designer paper could create! Or grab a cute image stamp and your favorite patterned paper to make a never-been-seen-before focal point for your card!" I embossed the image from the Upsy Daisy stamp set on First Edition Specialty DSP. I just love this paper as a background for stamped images! I added a few layered flowers (because I was still thinking about that gorgeous scarf!) and embossed the sentiment. Finally, I added some pearls to the layered flowers and the punched trim...why NOT? I followed the sketch but NOT the whole "clean and simple" thing...I need to learn how to use LESS in the layer department. Thanks so much for stopping by! Please visit Our Creative Corner to see what the rest of the lovely ladies on the Design Team have created this week. SO many beautiful designs!! You will NOT be disappointed. We sure hope you will join us and play along. Your card turned out beautifully Anne! I love those flowers stamped on the printed background. Great challenge! Very striking card! Love it. Gorgeous! And that inspiration scarf! I would love to have that. Maybe it's made out of very lightweight material so you could wear it, even in Texas. Stunning, Anne Marie! Oh my, the layers and textures... it's total eye candy. And I hear silhouettes are the new rage. They look fantastic against the text patterned paper. Happy travels next week! WOW this is pretty! 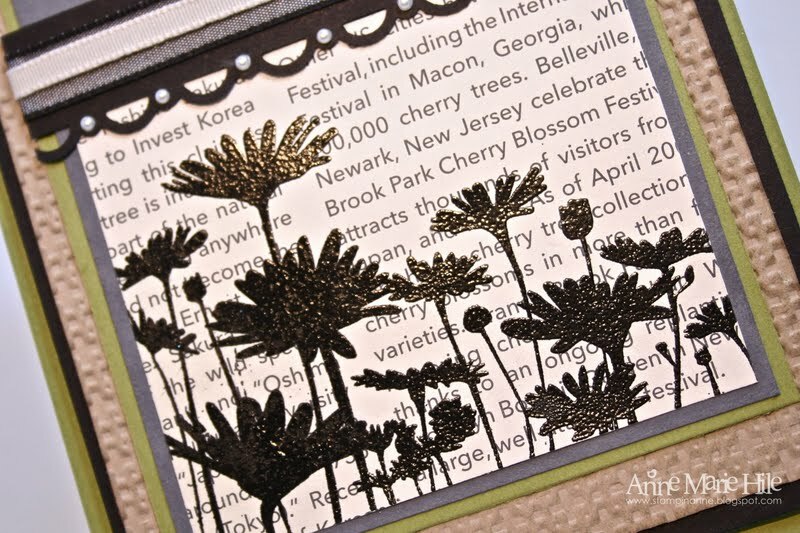 I love the stamped daisies on the book paper, very cool effect. Really lovely creation this week, Have a great holiday weekend! Wow, I'm so glad you combined these two challenges! This is fabulous and I LOOOOVE that daisies silhouette on the DP, so cool! I may have to try that as that particular stamp hasn't been inked in awhile over here! I really like the color combo you picked, too. Great fit :) Thanks for playing with us at colourQ this week! Just beautiful Anne!! The newsprint papers make such lovely backgrounds in different ways! The colour combo is so striking and you have balanced the colours so well. Love it! Lovely card, Anne! Love the colors you chose and how you used them. Thanks for joining us at the ColourQ for our 100th challenge. Oh wow ... a stunning creation Anne Marie, I really love what you have done here ... that stamp looks fabulous and really captures the attention as a black silhouette image ... love the colour combination so earthy and warm, love all the layers and the border/ribbon treatment is great!!! Stunning card Anne ~ I have yet to stamp on DP...hmm...maybe I'll have time to play later today ~ Thanks so much for the inspiration ~ Love your creativity ~ enjoy your day! WoW what a stunning Card. I absolutely love it. The Lay is great and you did a amazing Job with the color combo. I love images on text and you've used it wonderfully for this challenge. I'm glad you found some inspiration in the scarf and turned this into a beautifully executed card! This is gorgeous Anne, I so love your style!!! This is stunning! 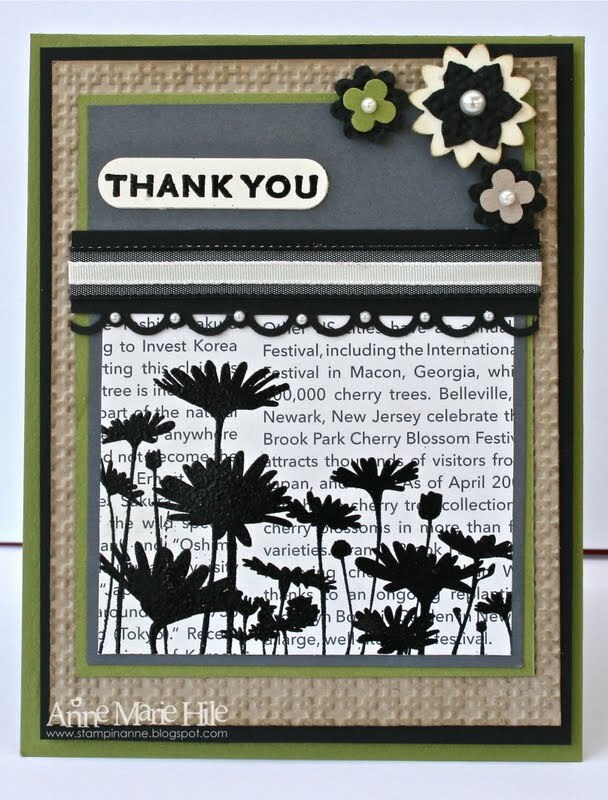 Love the colors and the embossed image & layered flowers are fabulous! As far as that scarf goes, you could always crank up the A/C!!! Another beautiful card!! anne marie, I just love that color combo and inspirational photo. How wonderfully pretty! and I'd say that you rocked it! 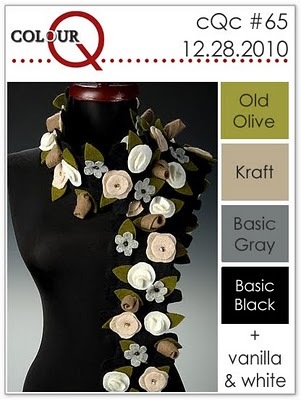 I agree the layered flowers on your card mimic the flowers on the scarf. Very prety! Ohmygosh! Your card is simply stunning and you're sure to win Queen!!! Great, great job on the challenge! LOVE THIS!!!! This is super fabulous!! Love the prints DP and the stamped image! Fantastic job on the sketch and color challenge too! Anne, this is one of my fave palettes and you certainly more than did it justice with this beauty! 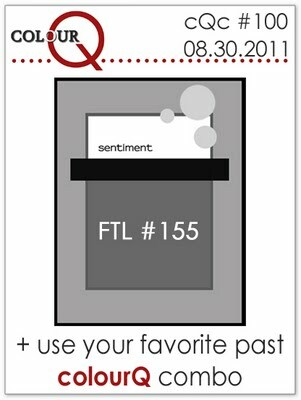 Thank you so much for playing along with the colourQ's 100th challenge! 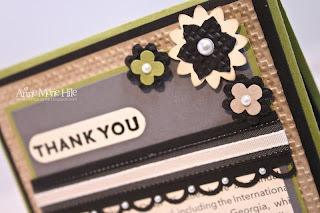 I love the flowers embossed in black! So elegant! I really have to remember that for those kinds of stamps. And the flowers in the corner! Yum!! But I have to say......I LOVE LOVE LOVE that scarf in the ColorQ PHOTO! I want it!! Love the rich color palette and use of texture!! !